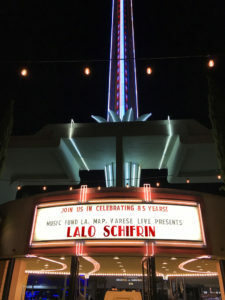 Renowned film and TV composer Lalo Schifrin turned 85 this year, and the occasion was commemorated Saturday night with a concert featuring many of his memorable themes — everything from Mission: Impossible and Mannix to Bullitt and Dirty Harry. It was a co-production of Musicians at Play Foundation and Varese Live, with proceeds benefiting the Music Fund of Los Angeles. The show consisted of nearly three hours of great big-band performances, beautifully rendered songs and rare video clips of the maestro at work; veteran Varese producer Robert Townson hosted. My review of the evening is here. This entry was posted in Composers, Film Music, Television Music and tagged Film Music Society, Lalo Schifrin, Mission: Impossible music, Music Fund of Los Angeles, Musicians at Play, Robert Townson, Schifrin 85th, Varese Live on October 10, 2017 by Jon Burlingame.